Iowa State's Curtis Struck and IBM's Bruce Elmegreen are studying how galaxies evolve from the clumpy example on the left to the smooth example on the right. Credit: Sloan Digital Sky Survey. (Phys.org) —It happens to all kinds of flat, disk galaxies – whether they're big, little, isolated or crowded in a cluster. They all grow out of their irregular, clumped appearance and their older stars take on the same smooth look, predictably fading from a bright center to a dim edge. Or, as Curtis Struck, an Iowa State University astronomer, wrote in a research summary: "In galaxy disks, the scars of a rough childhood, and adolescent blemishes, all smooth away with time." Struck, a professor of physics and astronomy who studies galaxy evolution and wrote the 2011 book "Galaxy Collisions," said a few explanations have been proposed, but most of those only covered certain types of galaxies. There hasn't been an explanation for the nearly universal and exponential fade in the brightness of the lookalike disk galaxies. To try to find an explanation, Struck and Bruce Elmegreen, a research scientist at IBM's Thomas J. Watson Research Center in Yorktown Heights, N.Y., built computer models simulating galaxy evolution. And they think they've found a fundamental answer in the gravitational pull of the irregular, clumped structure of younger galaxies. They report their findings in a paper, "Exponential Galaxy Disks from Stellar Scattering," just published online by The Astrophysical Journal Letters. Struck and Elmegreen based their paper on the simplest possible galaxy model that still includes all the essential ingredients: a razor-thin disk and orbiting stars subject to the gravity of the massive clumps. "We focused on the clumps," Struck said. "We thought the clumpy structure of young galaxy disks may be responsible for both its own erasure and the smooth universal brightness profile." Struck said the models showed that's the case. The gravity of those clumps of interstellar gases and new stars alter the orbits of nearby stars. In some cases, the changes are significant, scattering stars well away from their original and nearly circular orbits. Over time, that scattering from circular to slightly elliptical orbits produces the smooth fade in brightness from the center of a galaxy to its edge. We're talking a lot of time: "This process takes a few hundred million years to a few billion years," Struck said. Do those findings match the data coming from the Hubble Space Telescope and large ground-based telescopes, tools that allow astronomers to see distant galaxies in their young and clumpy structure? "Yes, they do fit the observed data coming back," Struck said. 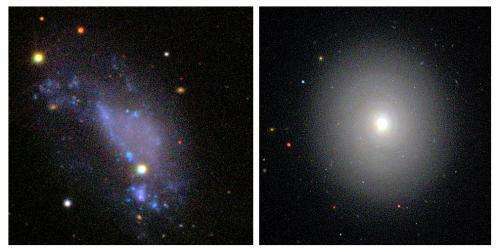 Struck also said there's more work to be done to explain the mystery of the smooth, steady fade of older disk galaxies. Struck and Elmegreen will gradually add more physical processes to their models to see how additional complexities affect what they've discovered about the fundamental process of star scattering. Even so, Struck said the current models have provided a good explanation for the universal appearance of older disk galaxies. "If there is some disturbance, some clumpiness in the galaxy," he said, "you eventually get this smooth profile."